I’m about to buy a new vacuum cleaner, and it’s somewhat expensive. It has the features I need. It will pick up cat hair, and it’s relatively quiet so my cats won’t freak out too much. Having a really good tool should mean I don’t procrastinate about vacuuming as I do now, which just makes the job worse when I do get around to it. It should last much longer than cheaper vacuum cleaners, so I’ll spend less over the long term, and I won’t be sending broken appliances to a landfill. And I won’t need to go through the whole time-consuming what-to-buy decision process again in a couple years. One place I’ve found I appreciate some beauty is in my note-taking tools. While I use a digital calendar and address book, I prefer using pen and paper for taking notes when on the phone, when working with clients, etc. My on-the-go tool is a pocket briefcase, but I’ve been making do with basic notepads in my home office. I don’t enjoy using those, though, so I’m planning to indulge in a small splurge and get a really nice notebook. Looking around my office I see lots of tools that work well for me, including my computer, my scanner, and my shredder, But there’s also my Camelbak Eddy water bottle, which someone once described to me as a sippy cup for adults. Because it’s so easy to take a few sips, I tend to drink more water throughout the day. It’s perfect to have sitting next to me when I’m working at my computer, because I’m not courting disaster as I would be with a normal glass or mug — and two cats who often jump onto the desk. While I think investing in good tools is often a wise decision, some good tools don’t cost much at all. Moving beyond my office, a tool that works extremely well for me is a specific brand of floss picks. I’ve always found other flossing tools to be awkward to use. But with these it’s easy for me to floss, so I actually do it. Good tools make us more efficient, help us tackle unpleasant tasks, and add a bit of joy to our daily lives. If there’s a tool you use frequently that isn’t working well for you, replacing it might be a wise choice if your finances allow you to do so. Digital photography is changing the hobby of photography in interesting ways. The most obvious change is the ease with which we can fire off 300 photos in a matter of minutes. As a result, we’ve got bulging digital photo libraries that have tech companies struggling to organize for us. Additionally, The Next Web reminded me of the emerging changes that we’re still working to understand. The following are explanations of some of the changes taking place and possible solutions to issues those changes might create. 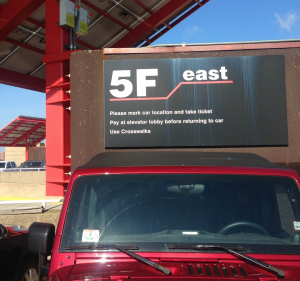 When I park my car in a huge public lot, I always take a shot of my parking space (“5F” for example) to help me remember where I parked. I do the same when driving a rental car, so I don’t forget which car in the lot is mine. And before driving out of the rental lot, I capture all the angles of the car to have proof of pre-existing scratches or issues that existed before I rented the car. More recently, I took a photo of a poster advertising a walking tour that looked like fun. As with the shot in the garage, the intention wasn’t to capture a moment, it was to capture information. Earlier this week, I received a phone call from my wife who was at work. “Can you go into my bag and find [Paper X]? I need you to send me a photo of it.” In this situation, she needed the information on a paper she left at home, and a photo of said paper — while not ideal — was the easiest way to get her the information she needed. I take images of specific shopping items a lot. If I need to buy a special lightbulb or odd battery for something at home, a quick picture of that product saves me from having to lug it with me to the store. Often times I’m out shopping with my wife when she expresses interest in something that I think will make a great gift. I’ll covertly take a photo of it to remind myself when the time comes to give her something. It’s really handy when, months later, I’m trying to remember exactly which scarf she meant. How to manage these types of photos? As Boris Veldhuijzen Van Zanten noted in his article on The Next Web, an ideal situation would feature apps that recognize when we’ve taken a throw-away photo or an image that’s meant for short-term memory, and act accordingly. Unfortunately, we’re not there yet. Until our phones get smarter about digital photo management, we must be proactive. First, if you’re backing up your photos to a cloud service like Dropbox, Google, or Apple’s iCloud, save yourself some space and don’t back up these shots. I use an app called Camera+. It allows me to shoot photos that aren’t sent to my phone’s camera roll where they’re automatically synchronized with my remote backup. Temporary photos I take exclusively with this app. Next, remember to delete those one-offs. This isn’t the best tip, I know, but it will save you storage space as well as those “Why did I take a picture of this?” moments in the future. Of course, you can turn to dedicated apps to help you manage these photos. Evernote is fantastic for long-term storage and supports photo notes beautifully. Gift Planner (free, iPhone) and Gifty (Android) will let you keep track of presents you’d like to buy. Lastly, Tiny Scanner for iPhone (free) and Smart Receipts (Android) will let you “scan” legible images of receipts and more. That was the most valuable quote and pervasive theme of my conversation with Heidi Solomon, the woman behind P.O.S.H., or Professional Organizing Systems by Heidi. Now 10 years into her organization business, Heidi took some time to sit with me to discuss best practices and creating a summer organization system that will last well beyond the warm weather. “I’m an organized person” means life can erupt and not cause an immense amount of stress to reset your space. Summer is starting, so we discussed strategies for being organized after coming home from a vacation or a trip. When you already have established locations for all the things you own, unpacking and returning to normal can be accomplished in a couple of hours, as opposed to living with suitcases for a few days. To me, summer means using a lot of towels. We live on a lake and that means the back porch is continually draped with towels. And bottles of sunscreen. Plus a few swim masks, beach toys…you get the idea. For many, summer introduces a unique mass of stuff. How, I asked, can we create a system for “summer stuff” that will last beyond August 31? She said it starts with what’s available to you. “If you have a closet that can accommodate these things in clear, labeled containers, great,” she told me. “If not, a door hanger works so well. Put the kids’ stuff at the lower level. That way everyone can just grab and go (and replace!) with ease.” Why clear containers? To help the young ones see what goes where. 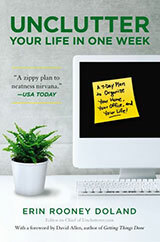 With a little thought, frequent re-evaluation and consideration for everyone in your organizing system, you can get through the busy summer — or any season — with solutions that work effectively. Big thanks to Heidi for taking time to chat with me. Are you sometimes frustrated when people don’t reply to your emails, texts, or voicemail messages? The following are two reasons that might be happening. When I was a magazine editor, I worked with someone whose preferred method of communication was email. That was fine with me, since I like email, too. But we also worked with a number of writers and photographers, and she sometimes had problems getting them to reply to her messages. I’d often find myself suggesting she try switching techniques and calling the person instead of sending yet another email. We all have our preferred communication tools, and insisting on yours without recognizing the other person’s preferences can lead to frustration all around. In a professional situation, having a discussion about your preferences and deciding how you’ll work together can help ensure messages get a timely reply. There’s no point in leaving a voicemail message for someone who hates voicemail and never checks it. You may want to note the person’s preferences in whatever tool you use to store phone numbers and email addresses. Long chatty emails with friends can be delightful. But if you’re sending an email where you want a timely response, it helps to make your message easy to absorb. An email with a bunch of long paragraphs is one that many recipients will skip over on an initial pass through their email inboxes. Be sure your subject line is descriptive. Use short paragraphs and bullet points. Make sure it’s very clear, preferably near the beginning of the message, exactly what it is you want the other person to do. Include any associated deadlines. Keep the email focused on a single topic. If you combine topics and the recipient isn’t ready to deal with just one of them, you may not hear back about any of them. Be as concise as possible while still conveying all the necessary information. Long rambling messages tend to be ignored, but so do messages that leave the recipient confused. Include all critical information in the body of the message, not in an attachment. And avoid attachments entirely whenever you reasonably can. Take the time to edit your email. I’ve found I can almost always improve on my first pass of an important message. Fix these two problems and you can be on your way to more timely responses. Tim Cook (Apple CEO), Jeff Bezos (Amazon CEO), and Jack Dorsey (Twitter founder and CEO) are some of the biggest names in business. It’s likely that their products touch your life every day. With such a tremendous amount of responsibility, how do these titans stay organized and on top of everything they need to do? Late last year, TIME magazine published a look at how high-profile tech CEOs stay organized. I love articles like this since a peek at such high-level organization and productivity is rare…and often surprisingly simple. The following are my favorite insights from the article. Jack Dorsey gives each day a theme. Mondays are for management tasks, Tuesdays for focusing on products, and so on. I’ve set aside a day for administration type work, but never thought of giving each weekday a theme and, therefore, a focus. Meanwhile, Marissa Mayer (president and CEO of Yahoo) looks to the impromptu moments that happen between meetings and scheduled get-togethers to spark meaningful ideas. “Some of the best decisions and insights come from hallway and cafeteria discussions, meeting new people, and impromptu team meetings,” she wrote to her employees in 2013. Facebook CEO Mark Zuckerberg embraces the power of creating goals for himself. In 2010, for example, he set out to learn Mandarin Chinese. Just four years later, he stunned an audience at China’s Tsinghua University by conducting a 30-minute interview entirely in their native language. I love this one as it seems we spend less and less time in quiet reflection, processing the day’s activities, lessons and challenges. It’s so easy to succumb to the temptation to fill every quiet moment with a smartphone or an app that there’s no time to let your mind work on what needs attention. I’m going to adopt this practice and intentionally make myself stop, reflect, and process each day. I recently added a basic table next to our washer and dryer and it has been tremendously useful. From holding clean clothes while I find a basket to letting those “lay flat to dry” sweaters do their thing, I’ve fallen in love with this simple addition to our laundry room. Since I started experiencing the benefits of this table, I’ve become obsessed with maxing out the laundry room’s efficiency and usefulness, and I want to share the best of what I’ve found with you. With four people living in our home, everyone is responsible for putting their own laundry away. 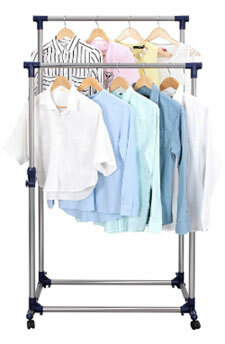 A simple shelving unit with labeled laundry baskets solves the issue. Fold, sort and hand them off to the right person for putting away. We’ve got two kids and we’re often finding odd things in their pockets. These have a tendency to get piled up on top of the dryer, but all that does is clutter up the space. Instead of the entire top of the dryer, I brought in a small container just for these objects. Now I can put the bobby pins, coins, LEGO figures, and who knows what into a nice, portable bowl for redistribution. Some items can’t go in the dryer. Those that must lay flat to dry can do so on the table or shelf. For the rest, an inexpensive garment rack can do the trick (and the one I linked to and is pictured above it features two bars for hanging clothes and is fully adjustable, which is great). Plus, if you get one on wheels, you can push it out of the way when you’re done. To me, organizing isn’t effective, if there isn’t a process of prioritization. … Furthermore, I believe subtraction always has to be part of the process. By saying “out of the way,” I don’t mean just discard and donate, but also sell, store, and archive. You can still keep things, but when you free up the most space for just the most important items, it is easiest to STAY organized. Of course, taking the less important things out of the way, must be done in such a way, that you can always TRUST that you can find what you want, when you want it, in storage and archives too. This definition really resonated with me because of my own situation this past month. I had hip replacement surgery, and I knew I’d have a lot of movement restrictions when I came home. So I really needed to put this definition of organizing into practice. Since I wouldn’t be able to bend down very far, I needed to prioritize what sat on my counters, within easy reach. So down came the food processor, since cooking just wasn’t going to happen for a while, and up came the paper plates for serving the Chinese food I could get delivered. In the closet that serves as my pantry, down came the staples for cooking (tomato sauce and such) and up came things like the bran cereal. Because of my movement limitations, I wound up working with a home services agency to get someone to come in weekly to do light housekeeping and laundry, and to run errands for me. Fortunately, my garage storage is organized, so I was able to tell her just where to find things like a new toothbrush. And yes, there was definitely some subtraction. One example: I knew I needed to find a place to stash the Bosu balance trainer which took up valuable floor space I would need when using a walker. I certainly wouldn’t be using the Bosu for a while! But then it dawned on me that this was a piece of equipment I probably wouldn’t want to use at all in the future (for fear of losing my balance and coming down in a way that damaged my new hip) and I gave it away on freecycle. The prioritization process also applied to my to-do list. I considered what things had to be done pre-surgery and was comfortable deferring everything else. Of course, Matt’s advice about prioritization works for everyday situations, too. There were many things I didn’t need to change, because my prior organizing efforts meant the most important things were already identified and readily accessible. But one side benefit of preparing for surgery was taking some time to re-evaluate what was important, and making some changes that will benefit me even after I’m fully recovered from the surgery. All Unitasker Wednesday posts are jokes — we don’t want you to necessarily buy these items, we want you to laugh at their ridiculousness. Enjoy! I guess, if you need your hotdogs to have that “dragon scale look” maybe you might want this. But, you could also use a knife to do that. So. Anyway, thanks to long-time reader Julie for sharing this with us (a product she doesn’t need because she’s a vegetarian but that she claims she wants, nonetheless … and that, for reasons unknown, is totally tempting us, too … gah! — unitasker temptations!!). Life fact: You’re more likely to use a tool that you enjoy using. Think about how you probably have a favorite knife in the kitchen, a preferred sweatshirt, or a beloved pair of hiking shoes and how those are your go-to items whenever you want to use that type of thing. The same goes for all manner of tools, including software. TeuxDeux is a great-looking, effective, simple to-do task manager that might become a favored companion for you. Its developers describe it as “designy,” but we can go with pretty and functional. It works in a browser or a mobile browser, so don’t worry about compatibility. If you’re an iPhone user, there’s an app for you. The following is a quick look at TeuxDeux. The app’s timeline shows you five days at a time. Your view isn’t restricted to Monday – Friday. Instead, you can focus on today and the next four. If you need a broader view, just move forward (or backward) in the timeline with a click. It’s fast and intuitive. To add a task, simply click beneath the appropriate day’s header and begin typing. You can reorder items by dragging them up and down on a day’s list, and even move them between days just as easily. To edit a task, just double-click it, enter your change, and hit enter. The app’s developers wanted to make something that was as “…easy as paper,” and I think they came very, very close. To me, paper is the ultimate in speed and efficiency because I learned all I needed to know about writing on paper in the first grade. At this point, there’s nothing new to learn. As far as the mechanics are concerned, that is. Similarly, using TeuxDeux requires only skills you mastered a very long time ago, like typing, clicking, and drag-and-drop. When you sign up, you’re good to go. What about advanced stuff like style (bold, italics) and recurring tasks? These things are not a problem. To make an event recur ever day, simply type “every day” at the end of the task. The same goes for every week, every month, and every year. Easy. The top half of TeuxDeux’s main window is pretty much a calendar of to-do items. Beneath that is what’s called the “staging area,” where you can create as many custom columns as you like, and fill them with whatever you want. For example, “To Read,” “For the Party,” “Errands,” “Dad Jokes,” or whatever you like. TeuxDeux is pretty, functional, and inexpensive. You can try it free for 30 days, and after that, sign up for a mere $3 per month (or $24 per year). June is upon us and if your kids (or you) aren’t already out of school then the last days of school are right around the corner. It’s time to say goodbye to homework and celebrate an end to the 2015-16 school year. With a little prep you can wrap up the school year with a tidy bow and prepare for next year now. Imagine staring the summer knowing that some of the work for back-to-school 2016-17 is already sorted. The following will help you get started. 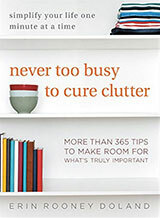 I’m all about avoiding clutter, so identify what we won’t need over the summer and put it away — now. The items on this list will depend on the age of your student(s). If your student attends a school that requires a uniform, make sure it’s properly stored away for the summer. (Be sure to properly store off-season clothes.) Before you store it away, however, consider if your kid will likely wear that size next fall. Will it fit in September or will the uniform requirements change when the kid goes back? If it’s not going to work, see if your school accepts donations of gently used uniforms or uniform components (vest, skirt, etc.). I don’t know about you, but I often find myself bemoaning the fact that I’ve got to buy a new batch of pencils, erasers, sharpeners, and so on each year. Chances are there are some good, perfectly useable options in Jr.’s bag. Set them aside for the “First Day Back Box,” which I’ll explain in a bit. They’ll be easy to find and save you a few bucks. It’s also a good time to sort through the bin of artwork and papers from the year and only store the best of the best items. Everything else can be photographed and some can be shipped off to grandma or an aunt or someone who would love to have one of your kid’s creations. For high school students and college kids, the list is certainly different. Sort through papers and materials and get rid of anything that won’t be reused or needed in the next school year. College students may find some textbooks invading their spaces. If the textbook is one you’ll need in the future for reference material, find a convenient but out-of-the-way location for it. If you’ll never have use for that Art History book again, sell it back to the bookstore or an online retailer (if you haven’t already). School bags can be used all year. A backpack, for instance, can follow a younger student to camp or family outings, like hikes. For older students, a shoulder bag could be useful at a summer job. Store these, however, if you don’t foresee a need. Let’s not forget the teachers when it comes to end-of-school! You folks work hard all year and now that those 180 long days are gone, it’s time to enjoy the summer sun. First, get organized from the year and prep for September. It’s always heartwarming to receive gifts from students and families you served over the last several months. If you’re a veteran teacher, however, they tend to accumulate. Have a plan for where these gifts are going to go if you choose to keep them. I know one teacher who uses a bit of hot glue and some wire to turn smaller gifts into tree ornaments. Her “teacher tree” is quite the sight each year. Others can be re-gifted (be honest, it happens). Just don’t let them take over your space. For some reason, teaching generates huge libraries of stuff, some of which never gets used. That draw of toilet paper tubes from the late ’90s? It might be time for them to go. Have a good, honest go-round in your classroom and ditch, donate, or hand-off to another teacher anything you probably won’t use. It’s likely that the custodial staff will give your classroom a good cleaning over the summer. You might return to find the furniture neatly stacked in the center of the room in September. Today, take a photo that shows how your room — each area — is set up. That way, you’ll have a reliable reference when you’re setting back up. Speaking of…. This is a clearly-labeled, accessible box that will be the first thing you open when you’re getting ready for school to resume in the fall, be you a teacher or a student (any grade level). Fill it with the most essential items that you’ll need for the start of school next year. That might include scissors, a stapler, paper clips, pen and paper, or thumbtacks. Maybe you’ll need some cash for a week of lunches, or pocket-sized tissues. High school students might add a USB flash drive or binders. Perhaps a college student will need an ID or course catalog. In any case, take the time before hitting the beach to think of the must-have items that will make your first day a breeze, collect them all, and create your (labeled) First Day Back Box. Finally, keep the box accessible as you will likely get a list of items necessary for the next school year during the summer, and you can easily add those items to the box. With a little forethought and elbow grease, you’ll have organized you stuff from the current school year and prepped for the fall.